With veterans and military families, “meeting clients where they are” may require additional training, and social workers are preparing to address this challenge. Soldiers coming home from the Iraq and Afghanistan wars share the age-old grievances of all warriors throughout history, such as grief, bodily injury, combat stress, fatigue, and emotional anguish. Added to these assaults, many are ambushed by the aftereffects of combat experience characterized by multiple and extended deployments, conditions such as PTSD and traumatic brain injury (TBI), as well as injuries from a new kind of weaponry called improvised explosive devices. Adding further emotional insult to injury, soldiers return to a country mired in economic woes that portend further struggles and to a society that, while supportive, may not necessarily understand the true nature of their military service or adequately attend to their needs. Veterans who experience TBI may need extensive care, a burden that falls not only on spouses and partners but also often on parents who are ill-equipped practically and emotionally. Because many of these veterans are married with children, the trauma of war ricochets to the family, creating collateral damage to spouses, children, and parents. And while their problems mount, it’s common for veterans to resist assistance for mental health issues out of fear of being stigmatized. In 2011, First Lady Michelle Obama and Second Lady Jill Biden, EdD, teamed to launch Joining Forces, a comprehensive initiative to heighten awareness of the sacrifices made by the military; galvanize support from all sectors of society for servicemen and women, veterans, and military families; heighten awareness of their critical needs in the three core areas of employment, education, and wellness; and advocate for a broad range of services to meet those needs. Led by social workers, Joining Forces, NASW, and a host of teachers, researchers, and helping professionals are answering the call to make a difference. When Biden took the stage, she acknowledged that “social workers are uniquely positioned to help reach our troops, veterans, and military families exactly where they are in every single county in America.” That statement, echoed by educators and other experts, positions the profession as the cornerstone of the solution—a burden and an honor the profession is proud to bear. “We’ve already seen growth in educational programs and initiatives that focus on social work with service members, veterans, and their families,” Hoffler says. In addition to seminars, symposiums, and conferences on the topic, numerous schools of social work, she observes, already have added courses, certificates, and entire tracks to their programs on social work within this population. At the forefront of this effort is Anthony Hassan, EdD, MSW, a clinical associate professor and director of the University of Southern California’s (USC) Center for Innovation and Research on Veterans and Military Families in Los Angeles and a retired Air Force officer who served during Operation Iraqi Freedom on the first Air Force combat stress control and prevention team embedded in an Army unit. With Marilyn Flynn, PhD, MSW, dean of the USC School of Social Work, Hassan helped jump-start the educational movement and drum the message that the social work profession needs to lead the way. The result of his efforts, USC’s subconcentration in military social work, is a three-course sequence for MSW students, including a two-day seminar on military culture along with two courses on military clinical practice with service members, veterans, and military families, and a two-semester internship in a military-impacted organization or an organization that cares for, or plans to care for, veterans, service members, and reservists or National Guard members. In addition to the campus-based program, USC offers military social work education to more than 300 of the 1,800 graduate students in more than 43 states through its virtual academic program. She researched, published, presented, and became increasingly passionate about sharing her newfound yet hard-won knowledge with other social workers, developing the course “Social Work Practice With the Military,” which she’s been teaching for several years at Yeshiva University’s Wurzweiler School of Social Work. There, she oversees a certificate program launched this year that requires MSW students to take four courses related to the military as well as perform field work that serves the military for a hands-on component. Military curricula are proliferating, with programs at institutions such as the Catholic University of America in Washington, DC, Boston College, and SUNY Empire State College. The emergence of these and other military social work programs begs the question of whether all social workers need training in military issues or merely those planning to specialize in working with this client population. 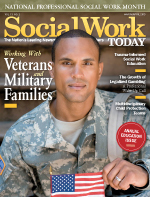 “We believe that all social workers, not just those who work at the VA or within the DoD, but clinical social workers, policy practitioners, educators, researchers, and direct practitioners at homeless shelters, domestic violence agencies, or substance abuse organizations, etc., need to have access to basic information so that when they do work with a military-connected family, they will have the tools and knowledge to inform their practice,” Hoffler says. This issue of military culture is a bone of contention among some practitioners. A precept of social work is to meet clients where they are. But there’s a belief among many well versed in the military experience that it’s difficult to meet clients where they are if you don’t truly know where they’ve been. However, not everyone agrees. Hassan has often discussed military culture with highly experienced social workers who say, “I don’t need to know the culture of all the people I work with, but I’m able to meet my clients where they’re at when they come in the door.” Hassan, however, is doubtful that social workers can make the therapeutic alliance strong without knowledge of the unique challenges and the aspects of military culture such as “their sacrifices, the seen and unseen war injuries” that affect the way veterans may perceive and respond to interventions.